Talk about bright and beautiful! 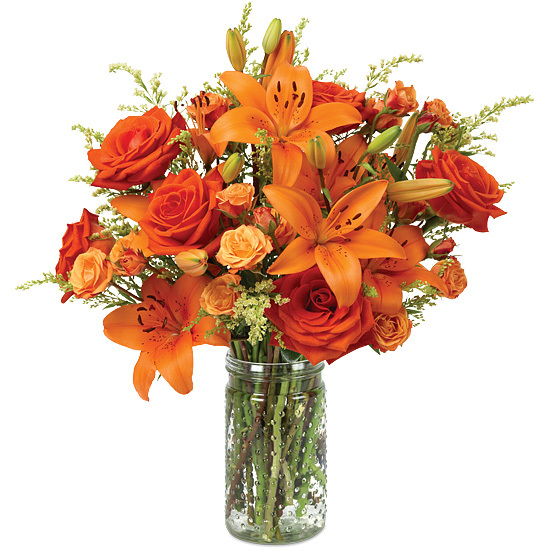 This gorgeous bouquet features Santana roses, Mambo spray roses, and multi-blossomed Asiatic lilies appearing in all their orange glory to impress someone special for birthday, get well, thank you, or just because. Wispy yellow solidago placed here and there adds even more glee and whimsy, and the gathering looks brilliant as can be in our signature glass vase. Remove all foliage that will fall below the water line. The roses may look a bit tired upon arrival. Don’t despair! They’re healthy – just thirsty. They will rehydrate and perk up within 24 hours after you cut all the stems underwater. 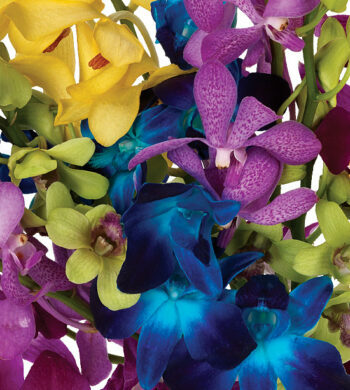 Your bouquet will look good with the different floral varieties in varying lengths. As the lilies open, you may gently pull off the pollen anthers to avoid pollen dust. Be careful not to get lily pollen on your clothing or linens. You may wish to place a protective mat under your bouquet to prevent pollen from falling on your furniture or carpet if you do not remove the anthers.